Quit your whining and start wining...And whinnying! 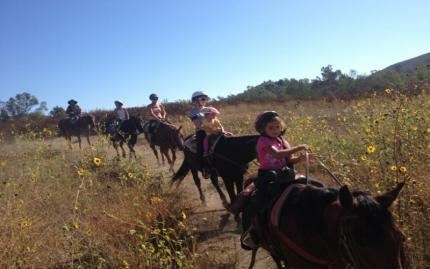 Enjoy a 90-minute scenic guided horseback ride in a nature preserve, followed by a wine tasting at Lorimar Winery! You will enjoy six tastings of the finest local wines while enjoying the ambiance of this beautiful winery. Lorimar also has a tasting room in Old Town Temecula surrounded by restaurants, bars and shopping in an old west setting. Don't worry if you've never been on a horse -- you'll have plenty of time to perfect your horseback riding skills as you get acquainted with your friendly, gentle four-legged steed. And don't forget your camera because you'll have the opportunity to pause for photos as you bask in the majestic, gorgeous sights of the mountains and valleys. The postcard-esque views will leave you breathless! Note: The tours departs from Susie Q Ranch 28330 Mary Place Murrieta, Ca. 92563. Please provide at least 24 hours cancellation notice to receive full refund. Any cancellations due to weather can be rescheduled. If there is rain in the forecast please call ranch a few hours before the ride to confirm if your ride needs to be rescheduled.